... and (sadly) do not care to cite my lowly blog. To infer the putative ancestral populations, we applied ADMIXTURE46 in an unsupervised mode to the filtered data set. This analysis uses a maximum likelihood approach to determine the admixture proportions of the individuals in question assuming they emerged from K hypothetical populations. We speculated that our method will be the most accurate when populations have uniform admixture assignments. In choosing the value of K that seemed to best satisfy this condition, we experimented with different Ks ranging from 6 to 12. We identified a substructure at K=10 in which populations appeared homogeneous in their admixture composition. Higher values of K yielded noise that appeared as ancestry shared by very few individuals within the same populations. ADMIXTURE outputs the speculated allele frequencies of each SNP for each hypothetical population. Using these data, we simulated 15 samples for each hypothetical population and plotted them in a PCA analysis with the Genographic populations. We observed that two hypothetical populations were markedly close to one another, suggesting they share the same ancestry and eliminated one of them to avoid redundancy. The remaining nine populations were considered the putative ancestral populations and were used in all further analyses. Given nine admixture proportions for a sample of unknown geographic origin obtained using ADMIXTURE’s supervised approach with the nine putative ancestral populations, we calculated the Euclidean distance between its admixture proportions and the N reference populations (GEN). 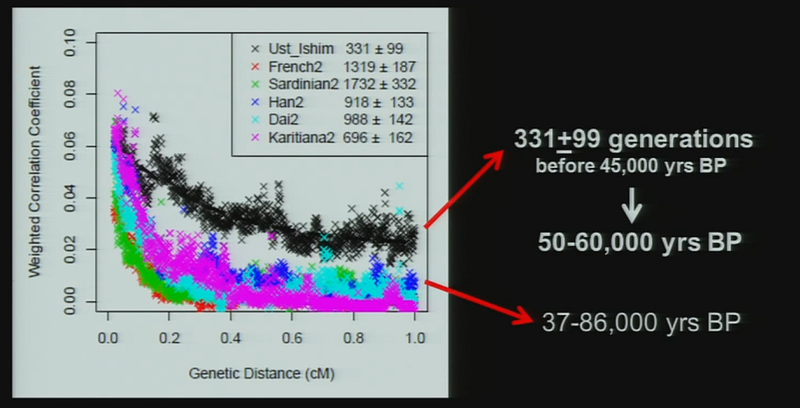 All reference populations were sorted in an ascending order according to their genetic distance from the sample. The most exciting use of "zombies" is to convert unsupervised ADMIXTURE runs into supervised ones. In unsupervised mode, ADMIXTURE treats all individuals alike, and tries to infer their ancestral proportions. In supervised mode, some individuals are treated as "fixed" (belonging 100% in one of K ancestral components), and the ancestry of the rest is inferred. The idea is fairly simple: run an unsupervised ADMIXTURE analysis once to generate allele frequencies for your K ancestral components; then generate zombie populations using these allele frequencies; whenever you want to estimate admixture proportions in new samples run supervised ADMIXTURE analysis using the zombie populations. ... and the first post on the Oracle which shows how to find proximity to a population by calculating Euclidean distance in the space of admixture proportions between reference populations and a test individual (and also considers mixtures of populations). I am flattered that the zombie approach has been copied and tested, but I doubt that all of the paper's 32 authors were unaware of the previous publication of the gist of their "new" method. The search for a method that utilizes biological information to predict humans’ place of origin has occupied scientists for millennia. Over the past four decades, scientists have employed genetic data in an effort to achieve this goal but with limited success. While biogeographical algorithms using next-generation sequencing data have achieved an accuracy of 700?km in Europe, they were inaccurate elsewhere. Here we describe the Geographic Population Structure (GPS) algorithm and demonstrate its accuracy with three data sets using 40,000–130,000 SNPs. GPS placed 83% of worldwide individuals in their country of origin. Applied to over 200 Sardinians villagers, GPS placed a quarter of them in their villages and most of the rest within 50?km of their villages. GPS’s accuracy and power to infer the biogeography of worldwide individuals down to their country or, in some cases, village, of origin, underscores the promise of admixture-based methods for biogeography and has ramifications for genetic ancestry testing. A new paper has just appeared in Science which adds new ancient Swedish hunter-gatherer samples, as well as a new Gökhem2 Swedish farmer. Much lower quality data from the same archaeological sites were studied in 2012 by much the same team, but the new study has sequenced several new Pitted Ware individuals from Ajvide, as well as a Mesolithic Swede. The Swedish hunter-gatherers appear to be similar to those of Lazaridis et al. (2013) in that their ancestry is a mixture of both European hunter-gatherers like LaBrana1 and ~15% of something related to MA1, which seems quite close to the 19% of ANE ancestry for the older Motala hunter-gatherer also from Sweden. The finding of Y-haplogroup I2a1 also parallels the Motala hunter-gatherers, so everything seems quite consistent with the Mesolithic Swedes being genetically very close to the Pitted Ware Neolithic ones. However, there is one difference in that the new hunter-gatherers were ancestral for SLC24A5 while the Motala one was derived (this is the "skin lightening" allele that was curiously missing in both Iberia and Luxembourg hunter-gatherers). The authors also find that the Iceman and Gökhem2 are a mixture of Basal Eurasians and something related to hunter-gatherers. A interesting new detail is that the Swedish farmer had more of the hunter-gatherer ancestry than the Iceman (the estimated difference in their non-Basal Eurasian ancestry is 77.2-56=21.2%) which seems reasonably close to the 16% difference in the related "Atlantic_Baltic" ancestry for the previous lower-quality Gok4 farmer and the Iceman I estimated in 2012. The Scandinavian Neolithic hunter-gatherer group had significantly lower conditional nucleotide diversity (0.181±0.0015) compared to the Scandinavian Neolithic farmer group (0.201±0.0038, Figs 3A and S9). While the specific properties of ancient DNA may still affect comparisons with sequence data from modern-day individuals, the conditional nucleotide diversity in the hunter-gatherers was also lower than in any modern-day European and a Chinese population (22) analyzed using the same approach as for the ancient groups. It is not easy to estimate nucleotide diversity with low coverage data (because you can't tell whether a sample is heterozygous in some position if you only have a handful of reads covering it), but the authors cleverly use the fact that they have multiple individuals from the hunter-gatherer population to estimate this. The low diversity in hunter-gatherers also parallels the finding of low genetic diversity in the Luxembourgeois Mesolithic hunter-gatherer, so it does seem that hunter-gatherers in Europe were a very low diversity population, which seems reasonable for people engaging in foraging (which does not allow for growth to large population numbers) and having ancestors who endured the Ice Age in Europe. The last few months have been extremely generous in new ancient DNA studies and I hope that more stuff is coming this year as in 2013. “We see clear evidence that people from hunter-gatherer groups were incorporated into farming groups as they expanded across Europe. This might be clues towards something that happens also when agriculture spread to other parts of the world,” Dr Skoglund said. Pontus Skoglund, Helena Malmström et al. Prehistoric population structure associated with the transition to an agricultural lifestyle in Europe remains contentious. Population-genomic data from eleven Scandinavian Stone-Age human remains suggest that hunter-gatherers had lower genetic diversity than farmers. Despite their close geographical proximity, the genetic differentiation between the two Stone-Age groups was greater than that observed among extant European populations. Additionally, the Scandinavian Neolithic farmers exhibited a greater degree of hunter-gatherer-related admixture than that of the Tyrolean Iceman, who also originated from a farming context. In contrast, Scandinavian hunter-gatherers displayed no significant evidence of introgression from farmers. Our findings suggest that Stone-Age foraging groups were historically in low numbers, likely due to oscillating living conditions or restricted carrying-capacity, and that they were partially incorporated into expanding farming groups. We present the DNA sequence of 17,367 protein-coding genes in two Neandertals from Spain and Croatia and analyze them together with the genome sequence recently determined from a Neandertal from southern Siberia. Comparisons with present-day humans from Africa, Europe, and Asia reveal that genetic diversity among Neandertals was remarkably low, and that they carried a higher proportion of amino acid-changing (nonsynonymous) alleles inferred to alter protein structure or function than present-day humans. Thus, Neandertals across Eurasia had a smaller long-term effective population than present-day humans. We also identify amino acid substitutions in Neandertals and present-day humans that may underlie phenotypic differences between the two groups. We find that genes involved in skeletal morphology have changed more in the lineage leading to Neandertals than in the ancestral lineage common to archaic and modern humans, whereas genes involved in behavior and pigmentation have changed more on the modern human lineage. Ana T. Duggan et al. Archaeology, linguistics, and existing genetic studies indicate that Oceania was settled by two major waves of migration. The first migration took place approximately 40 thousand years ago and these migrants, Papuans, colonized much of Near Oceania. Approximately 3.5 thousand years ago, a second expansion of Austronesian-speakers arrived in Near Oceania and the descendants of these people spread to the far corners of the Pacific, colonizing Remote Oceania. To assess the female contribution of these two human expansions to modern populations and to investigate the potential impact of other migrations, we obtained 1,331 whole mitochondrial genome sequences from 34 populations spanning both Near and Remote Oceania. Our results quantify the magnitude of the Austronesian expansion and demonstrate the homogenizing effect of this expansion on almost all studied populations. With regards to Papuan influence, autochthonous haplogroups support the hypothesis of a long history in Near Oceania, with some lineages suggesting a time depth of 60 thousand years, and offer insight into historical interpopulation dynamics. Santa Cruz, a population located in Remote Oceania, is an anomaly with extreme frequencies of autochthonous haplogroups of Near Oceanian origin; simulations to investigate whether this might reflect a pre-Austronesian versus Austronesian settlement of the island failed to provide unequivocal support for either scenario. The main conclusion -"the scene of the meeting between a Neanderthal and a Cro-magnon does not seem to have taken place on the Iberian Peninsula"- is the same as the one that has been gradually reached over the last three years by different research groups when studying key settlements in Great Britain, Italy, Germany and France. "For 25 years we had been saying that Neanderthals and early humans lived together for 8,000-10,000 years. 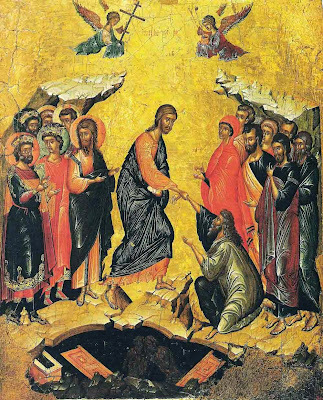 Today, we think that in Europe there was a gap between one species and the other and, therefore, there was no hybridation, which did in fact take place in areas of the Middle East," explained Arrizabalaga. The UPV/EHU professor is also the co-author of a piece of research published in 2012 that puts back the datings of the Neanderthals. "We did the dating again in accordance with the ultrafiltration treatment that eliminates rejuvenating contamination, remains of the Mousterian, the material culture belonging to the Neanderthals from sites in the south of the Peninsula. Very recent dates had been obtained in them -up to 29,000 years- but the new datings go back to 44,000 years older than the first dates that can be attributed to the Cro-Magnons," explained the UPV/EHU professor. Since the late 1980s, northern Iberia has yielded some of the earliest radiocarbon dated Aurignacian assemblages in Western Europe, probably produced by anatomically modern humans (AMHs). This is at odds with its location furthest from the likely eastern entry point of AMHs, and has also suggested to some that the Châtelperronian resulted from cultural transfer from AMHs to Neanderthals. However, the accuracy of the early chronology has been extensively disputed, primarily because of the poor association between the dated samples and human activity. Here, we test the chronology of three sites in northern Iberia, L'Arbreda, Labeko Koba and La Viña, by radiocarbon dating ultrafiltered collagen from anthropogenically modified bones. The published dates from Labeko Koba are shown to be significant underestimates due to the insufficient removal of young contaminants. The early (c.44 ka cal BP [thousands of calibrated years before present]) Aurignacian chronology at L'Arbreda cannot be reproduced, but the reason for this is difficult to ascertain. The existing chronology of La Viña is found to be approximately correct. Together, the evidence suggests that major changes in technocomplexes occurred contemporaneously between the Mediterranean and Atlantic regions of northern Iberia, with the Aurignacian appearing around 42 ka cal BP, a date broadly consistent with the appearance of this industry elsewhere in Western Europe. 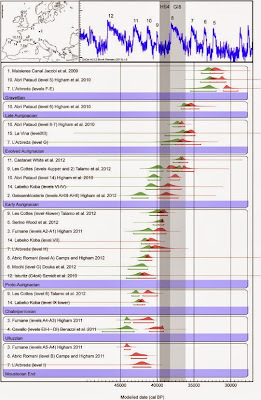 Although there has been much interest in estimating histories of divergence and admixture from genomic data, it has proved difficult to distinguish recent admixture from long-term structure in the ancestral population. Thus, recent genome-wide analyses based on summary statistics have sparked controversy about the possibility of interbreeding between Neandertals and modern humans in Eurasia. Here we derive the probability of full mutational configurations in nonrecombining sequence blocks under both admixture and ancestral structure scenarios. Dividing the genome into short blocks gives an efficient way to compute maximum-likelihood estimates of parameters. We apply this likelihood scheme to triplets of human and Neandertal genomes and compare the relative support for a model of admixture from Neandertals into Eurasian populations after their expansion out of Africa against a history of persistent structure in their common ancestral population in Africa. Our analysis allows us to conclusively reject a model of ancestral structure in Africa and instead reveals strong support for Neandertal admixture in Eurasia at a higher rate (3.4−7.3%) than suggested previously. Using analysis and simulations we show that our inference is more powerful than previous summary statistics and robust to realistic levels of recombination. We analyze the sharing of very short identity by descent (IBD) segments between humans, Neandertals, and Denisovans to gain new insights into their demographic history. Short IBD segments convey information about events far back in time because the shorter IBD segments are, the older they are assumed to be. The identification of short IBD segments becomes possible through next generation sequencing (NGS), which offers high variant density and reports variants of all frequencies. However, only recently HapFABIA has been proposed as the first method for detecting very short IBD segments in NGS data. HapFABIA utilizes rare variants to identify IBD segments with a low false discovery rate. We applied HapFABIA to the 1000 Genomes Project whole genome sequencing data to identify IBD segments which are shared within and between populations. Some IBD segments are shared with the reconstructed ancestral genome of humans and other primates. These segments are tagged by rare variants, consequently some rare variants have to be very old. Other IBD segments are also old since they are shared with Neandertals or Denisovans, which explains their shorter lengths compared to segments that are not shared with these ancient genomes. The Denisova genome most prominently matched IBD segments that are shared by Asians. 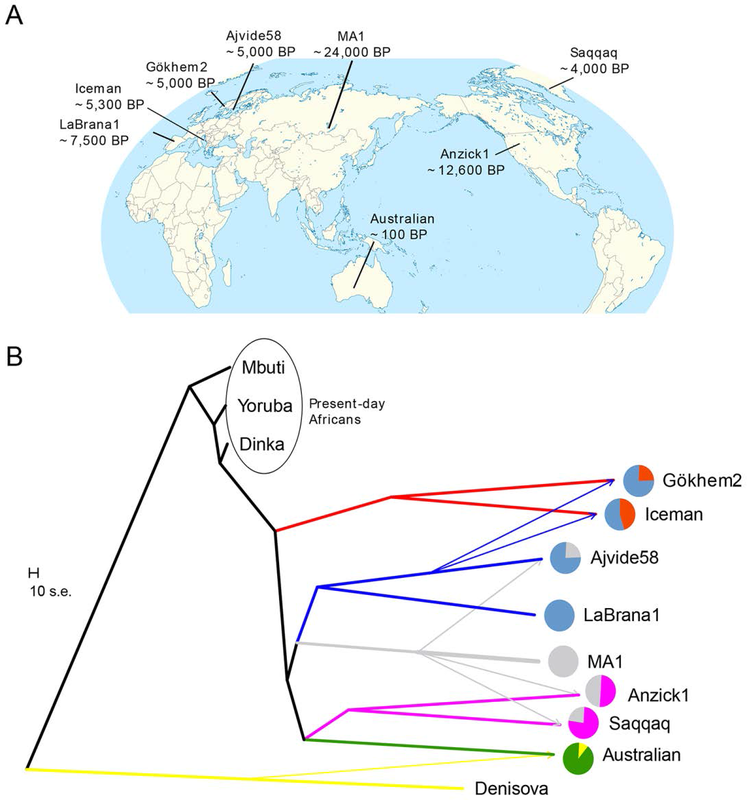 Many of these segments were found exclusively in Asians and they are longer than segments shared between other continental populations and the Denisova genome. Therefore, we could confirm an introgression from Deniosvans into ancestors of Asians after their migration out of Africa. While Neandertal-matching IBD segments are most often shared by Asians, Europeans share a considerably higher percentage of IBD segments with Neandertals compared to other populations, too. Again, many of these Neandertal-matching IBD segments are found exclusively in Asians, whereas Neandertal-matching IBD segments that are shared by Europeans are often found in other populations, too. Neandertal-matching IBD segments that are shared by Asians or Europeans are longer than those observed in Africans. This hints at a gene flow from Neandertals into ancestors of Asians and Europeans after they left Africa. Interestingly, many Neandertal- or Denisova-matching IBD segments are predominantly observed in Africans - some of them even exclusively. IBD segments shared between Africans and Neandertals or Denisovans are strikingly short, therefore we assume that they are very old. This may indicate that these segments stem from ancestors of humans, Neandertals, and Denisovans and have survived in Africans. According to Dr. Paabo, Ust-Ishim has longer Neandertal chunks than modern humans and this can be used to estimate that the admixture with Neandertals happened 331+/-99 generations before its time of 45,000y BP, or around 50-60,000y BP. The coalescence of mtDNA haplogroups M and N has been estimated as ~50 and ~59ky BP respectively using modern human variation, so this seems quite compatible with that. This pretty much proves that there were modern humans in Eurasia before the Upper Paleolithic revolution and disproves Richard Klein's theory that modern humans together with UP technologies spread Out-of-Africa only after 50,000 years ago. Archaeobotanical data from Central Eurasian pastoralist campsites have major implications for our understanding of late prehistoric agriculture across Asia. Sites like Tasbas and Begash illustrate the earliest acquisition of domesticated crops by mobile pastoralists and illustrate their capacity to participate in exchanges that bridged East Asian and Central Asian farming cultures by the early third millennium BC. Mobile pastoralists living in (southern) Central Asian alluvial fans and along the mountainous spine of Central Eurasia also integrated farming into their own domestic strategies (at least) by the mid second millenniumBC. Their pastoral mobility and the formation of extensive networks throughout the IAMC helped spread particular grain morphotypes and a mixed plant cohort of wheat, barley, millet and green peas through the mountains between Xinjiang, China and southwest Asia in the second millennium BC. The seasonal campsites of Begash, Tasbas, Ojakly and Site 1211/1219 are the earliest sites thus far reported to break down the strict polarization between nomads and farmers in prehistoric Central Eurasia. They also transform our comprehension of the vast arena of interaction that defines this region in ancient times. Archaeological research in Central Eurasia is exposing unprecedented scales of trans-regional interaction and technology transfer between East Asia and southwest Asia deep into the prehistoric past. This article presents a new archaeobotanical analysis from pastoralist campsites in the mountain and desert regions of Central Eurasia that documents the oldest known evidence for domesticated grains and farming among seasonally mobile herders. 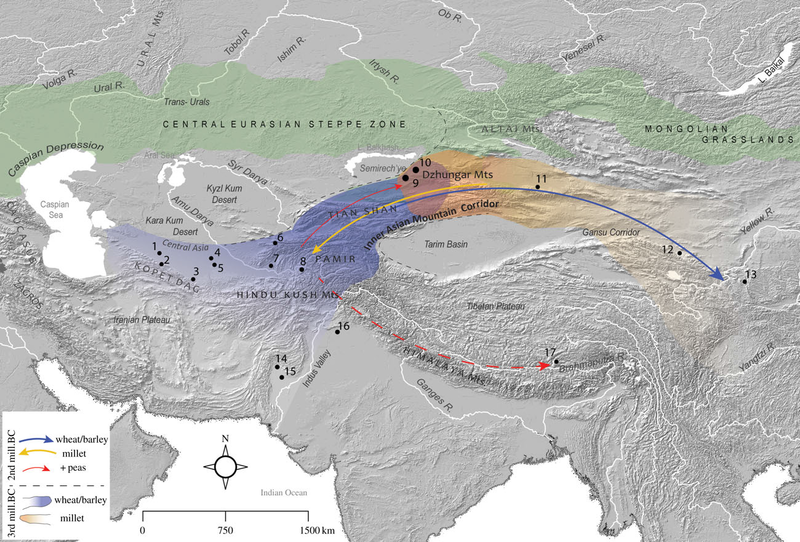 Carbonized grains from the sites of Tasbas and Begash illustrate the first transmission of southwest Asian and East Asian domesticated grains into the mountains of Inner Asia in the early third millennium BC. By the middle second millennium BC, seasonal camps in the mountains and deserts illustrate that Eurasian herders incorporated the cultivation of millet, wheat, barley and legumes into their subsistence strategy. These findings push back the chronology for domesticated plant use among Central Eurasian pastoralists by approximately 2000 years. Given the geography, chronology and seed morphology of these data, we argue that mobile pastoralists were key agents in the spread of crop repertoires and the transformation of agricultural economies across Asia from the third to the second millennium BC. In the latest study, published online today in Nature Communications, Khaitovich and his international team analyzed the distribution of Neandertal gene variants in the genomes of 11 populations from Africa, Asia, and Europe. They found that Europeans inherited three times as many genes involved in lipid catabolism, the breakdown of fats to release energy, from Neandertals as did Asians. (As expected, Africans did not carry any of these Neandertal variants.) The difference in the number of Neandertal genes involved with lipid processing was “huge,” Khaitovich says. The study also offers another example of the lingering genetic legacy left in some people today by the extinct Neandertals. The team found that Europeans had differences in the concentration of various fatty acids in the brain that were not found in Asians or chimpanzees, which suggests they had evolved recently. The Europeans also showed differences in the function of enzymes that are known to be involved with the metabolism of fat in the brain. The article itself is open access. Ekaterina E. Khrameeva et al. Although Neanderthals are extinct, fragments of their genomes persist in contemporary humans. 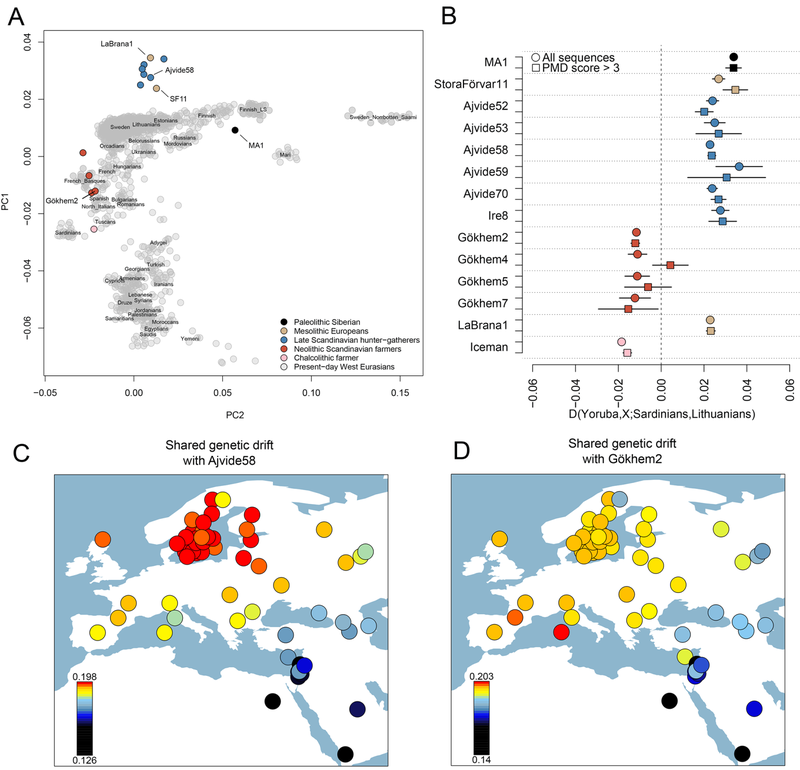 Here we show that while the genome-wide frequency of Neanderthal-like sites is approximately constant across all contemporary out-of-Africa populations, genes involved in lipid catabolism contain more than threefold excess of such sites in contemporary humans of European descent. 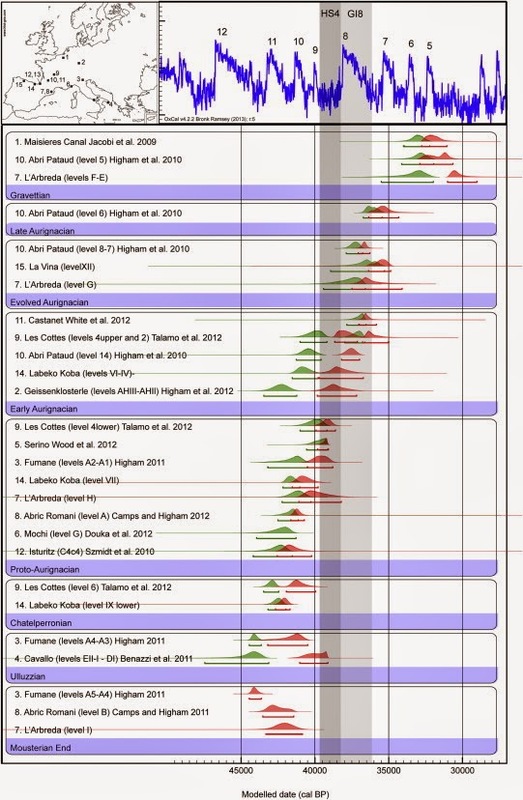 Evolutionally, these genes show significant association with signatures of recent positive selection in the contemporary European, but not Asian or African populations. Functionally, the excess of Neanderthal-like sites in lipid catabolism genes can be linked with a greater divergence of lipid concentrations and enzyme expression levels within this pathway, seen in contemporary Europeans, but not in the other populations. 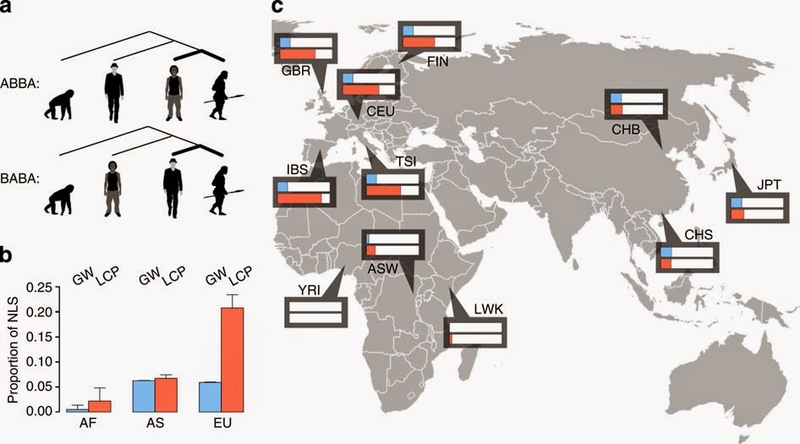 We conclude that sequence variants that evolved in Neanderthals may have given a selective advantage to anatomically modern humans that settled in the same geographical areas.